David O. Russell has had a unique identity from the early stages of his work, whatever amalgamation of styles he has borrowed. From Three Kings, his Iraq War treasure-hunting drama with considerable political undertones, to the performance-strong The Fighter, he has been a well- respected American director in his own right. As such, at this stage in his career, it is difficult to understand why he has regressed to the stature of big-budget amateur imitation - but it is exactly what he has done with American Hustle. The story tells of a New Jersey conman (Bale) who looks to run the biggest con of all on a corrupt mayor (Jeremy Renner). With his partner-in-crime (Adams), a firecracker ex-wife (Lawrence), and some shady individuals involved, it inevitably spirals out of control - sort of. It is genuinely surprising how poor the result of this 70's cultural-criminal odyssey is, particularly the cringe-worthy performances from otherwise reliably good actors. The script weakens even Adams and Bale, who wonderfully brought to life their respective roles in The Fighter under the same direction. Bradley Cooper is particularly unbelievable as a sad-sack cop who aspires for glory and success, but is generally as dull as dishwater to watch. For a movie so taken with its own glitzy, fancy-dress production values, it remains terribly unexciting. If one can look past the embarrassing artificiality of the era's hairstyles and costumes, and the obvious choice of signpost rock music, there is still a painfully contrived story-line and dialogue, with characters constantly soliloquizing on their ambitions for success. It must be said (at the risk of sounding spiteful), it's as if Russell had never seen a Scorsese movie, but instead had asked a child to watch one for him and report back the stylistic details. So obnoxious is its excessive, clumsy mess of chest hair and poly-blend that one wonders if it is Russell's crass attempt at the kind of postmodern nostalgia machine that always draws in large audiences. Regardless, the film occasionally shows brief sparks of hope. In a nightclub scene featuring Robert De Niro, the tension ratchets up, allowing for a powerhouse Adams/Lawrence run-in that reveals both the actors' innate talents and Russell's obvious capacity for good Hollywood storytelling. Unfortunately, that's precisely what's in short supply here. It gains some momentum as the crosses and double-crosses increase, but ultimately not enough to save it from the cinematic doldrums. 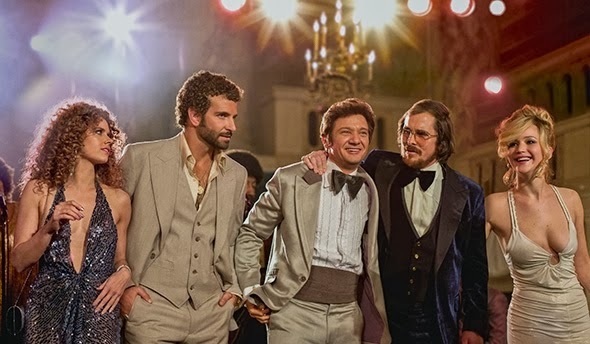 As a Goodfellas and Boogie Nights obsessive, I should have been primed to love American Hustle, but it is a weak pastiche of the aforementioned films. It isn't even multi-layered enough to cut it as parody.